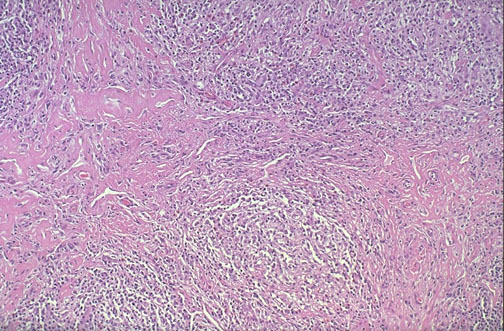 At medium power, nodular sclerosing Hodgkin's disease has prominent bands of fibrosis. Staging of Hodgkin's disease is important to try and determine therapy and the prognosis. Staging is often done by radiographic means, with CT scans used to determine where lymphadenopathy is located, ultrasonography to determine size and lesions of liver and spleen, and chest radiograph. Histologic diagnosis is typically made from biopsy of an involved lymph node. A bone marrow biopsy is typically performed as well. Staging laparotomy is less commonly used nowadays because the radiographic procedures are excellent.